If you're into getting your food thrown at you and eating it too, you don't need to go on a disaster date. 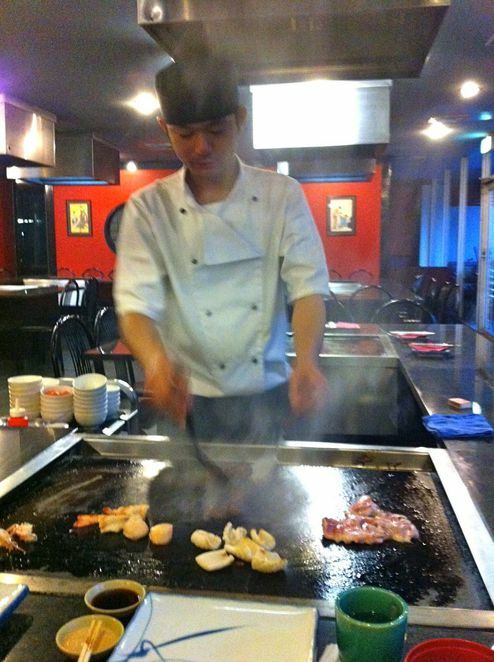 Just head over to Ichiban Teppanyaki in Parramatta. The chefs are trained to entertain you by doing party tricks you probably shouldn't try at home, unless you want to burn yourself. It's great to go here in a large group where you can share a laugh, make fun of each other and enjoy some delicious food, which is cooked on the hot plate right in front of you. Straight from the hotplate and into your mouth. Make sure you don't wear nice clothes since you will get dirty no matter how good you are at catching bowls of rice or letting someone flick fried egg into your mouth. This is probably not a place for someone who hates wasting food since most of it will end up on the ground rather than on your plate. That being said, you'll still walk out of here full with lots to talk about and bits of rice in your hair. For the Teppanyaki experience, the banquet meals (3 options) will cost you from $36.00 - $48.00. This price doesn't include any drinks which will be extra, but they do have a fully licensed bar. The interior of the restaurant is outfitted with oriental lamps, red walls and screen paintings with several seating areas surrounding the stove tops. The restaurant is located on 9 Wentworth Street Parramatta. Street parking is available, but few. Check signage since this is metered parking so it becomes free after around 6:30pm. There is also a car park with good evening rates around the corner. Ichiban Teppanyaki is open 7 days a week from 11:30am - 3:30pm & 5:00pm - 10:30pm (Monday - Friday) and 5:00pm - 10:30pm (Saturday & Sunday). Why? For fun and food. Cost: $36-$50 for banquet. Drinks are extra. Imagine what Japanese school dinners must be like; you'd be encouraged to have a food fight.